Ancient state regalia is preserved in the Armoury of the Moscow Kremlin ventsy (caps of sovereignty), scepters, orbs barmy (small mantles), crowns and thrones Court ceremonial was of great importance in the Middle Ages. People saw it as an expression of the wealth and might of the state The regalia were wrought by talented goldsmiths and richly ornamented with precious stones In other words these are not only symbols of the royal power, but also magnificent works of decorative and applied art. The world-famous Cap of Monomachus, the earliest royal venets, was received according to a legend by Prince Vladimir Monomachus of Kiev from his grandfather, Emperor Constantine of Byzantium. 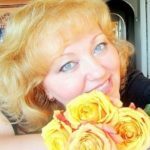 In all the testaments of the Moscow princes it is referred to as the Golden’ , it is called Monomachus ‘ for the first time in the testament of Ivan the Terrible. Thus, the Cap, having received the name of Monomachus, became a symbol not only of supreme authority but of authority in succession from Byzantium. 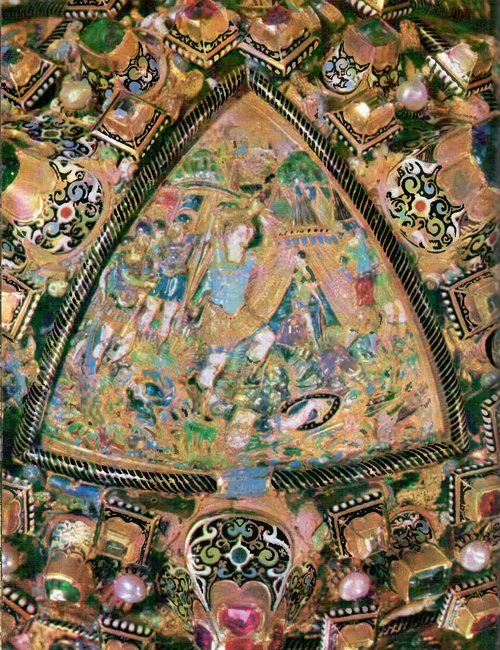 There is no consensus of opinion among scholars concerning the origin of the Cap of Monomachus Some think that it was manufactured in Byzantium, others ascribe it to Arab or Arab Egyptian art, yet others are of the opinion that it is of Central Asian (Bukhara) workmanship Its origin, like its appearance in the royal treasury, remains an enigma, and awaits new and meticulous investigation. The Cap of Monomachus is a unique piece of jewelry of late thirteenth or early fourteenth century origin. The crown of the Cap, its earliest part, consists of eight gold plaques covered with most delicately executed designs, in which spiral-like curlicues, six-pointed rosettes and lotus flowers merge into a single whole. One part of this intricate design is executed in gold ribbon with granulation, another bears a pattern of oblique incisions which create an illusion of fine twisted wire. The edges of the plaques are decorated with moved ornamental bands. Originally the Cap had a row of pearl and golden pendants, but later it was trimmed with sable fur and received a surmount of a gold engraved hemisphere. Later-date additions are the precious stones: rubies emeralds, sapphires, tourmalines and large pearls. 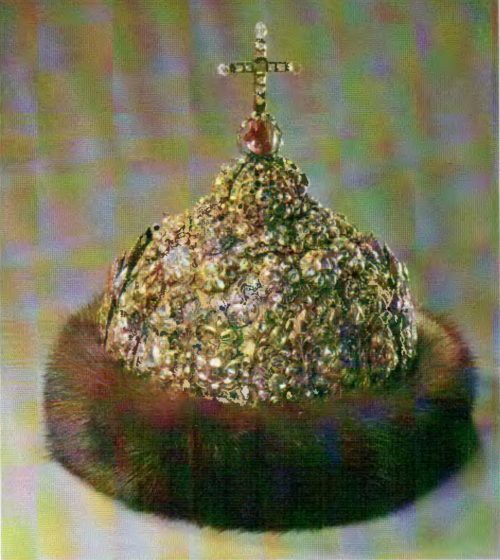 All the grand princes and tsars of Moscow were crowned with the Cap of Monomachus. Another venets—the Cap of the Kingdom of Kazan—was most likely, made in honor of the 1552 conquest of the Kazan Khanate, and can be considered a relic marking one of the most important stages in the creation of the Russian multinational state. Executed with great skill, the Cap of Kazan combines oriental and typically Russian, Moscow motifs The slightly elongated golden crown of the Cap is entirely covered with a profusion of carved and nielloed decoration it bears three rows of lacy kokoshniks, a design very popular in Russian architecture and Russian applied art. The choice of gems for decoration—pearls blue turquoises is typical of oriental works of art The Cap is surmounted by a deep red precious stone the Chinese spinel (a species of tourmaline). In 1627 it was replaced with a large yellow topaz fixed between two pearls, and the Chinese spinel went to decorate the Diamond Cap of Tsar Ivan Alexeievich. The diamond throne Persia 17th century. In the sixteenth century the splendor of the royal court at the Kremlin amazed foreigners According to Hans Kobentzel envoy of the German Emperor Maximil аn II who visited Moscow in 1576 Tsar Ivan the Terrible and his son appeared during the audience in robe studded with precious stones and pearls, and on their caps were “rubies blazing like fire, the size of a chcken egg” Never in my life have I seen things more costly or more beautiful. 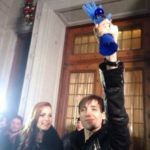 wrote Hans Kobentzel In the past year I saw crowns or mitres of our Sacred Majesty I have seen the crown and all the robes of the Most Catholic King… the many adornments of the King of France and His Imperial Majesty in the Hungarian Kingdom and in Bohemia and other places. Believe me that all these cannot be compared in the smallest degree to what I have seen here. With the assertion and consolidation of autocratic rule in the seventeenth century the court ceremonial, defined in the minutest detail became even more splendid. In 1627-1628 the jewelers at the Kremlin workshops made “the Grand State Regalia for Mikhail Fyodorovich Remarkable in its magnificence and sheer value it comprised a venets scepter and orb. 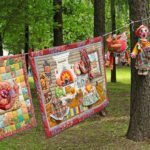 The general trend towards greater decorativeness in the development of the seventeenth century applied art led to a wider use of a variety of materials and technical methods The combination of brightly colored enamels and precious stones became a favorite method. The chased golden venets of the Grand Regal a of Tsar Mikhail Fyodorovich is encircled with typically Russ an open work crenellations’ and medallions with precious stones used in great number which in a combination with white, light blue and green enamel create a sonorous color range and patterns well in keeping with the aesthetic demands of the period. The orb of the Grand Regalia is a golden sphere divided into two equal hemispheres and surmounted by a tall cross. The upper hemisphere n its turn is divided into four parts, each bearing a chased scene from the life of the biblical King David symbolizing the wisdom of the ruler The delicately carved reliefs are covered with polychrome enamel. 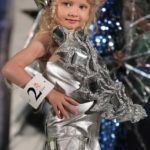 The scepter consists of three small rods joined together, and entirely covered with pastel enamels and precious stones. All this variety of color and pattern was not only in keeping with the new tastes it was designed to testify to the wealth and might of the Russian state Each monarch n turn either renovated the regalia of his predecessor or ordered new sets to be made In 1657 Alexei Mikhailovich commissioned Master Ivan Yuriev of Constantinople to make orb, scepter, staff and barmy of gold decorated with medallions with precious stones and emerald enamel create sonorous bright constellations. The amazing profusion and magnificence of the decoration lent the objects and emerald enamel create sonorous bright combinations. 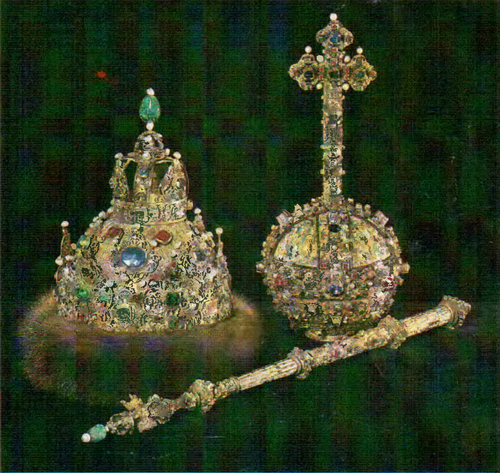 The amazing profusion and magnificence of the decoration lent the objects additional splendor and elegance In 1682 for the ascension of the throne by two brothers, coruers, Ivan Alexeievich and Pyotr Alexeievich, the jewelers at the Kremlin produced the ‘Cap of Monomachus of the Second Regalia copying the earlier Cap only in the general silhouette. The golden crown of the Cap, left unadorned sets off the beauty of the precious stones in simple mounts, surrounded with pearls whose design stresses the triangular form of the golden plaques. In 1684 a light-weight cap of silver brocade was made for Ivan Alexeievich Its crown was decorated with bright-colored ornamental strips and lacy plaques with precious stones and enamel. In their form and technique the plaques are close to the decorations on the venets of Mikhail Fyodorovich. In 1682-1689 two diamond caps were made for the brothers Ivan Alexeievich and Pyotr Alexeievich, magnificent examples of the jeweler’s art. The diamonds in the cap of Ivan Alexeievch form an involved design of flowers, leaves and two-headed eagles The play of light on the diamonds is heightened by the various angles at which the paques are disposed. The stones are used in such profusion that their sparkle merges into a single radiance. The emeralds and tourmalines on the cap of Pyotr Alexeievich set off the cold fire of the diamonds. The cap is surmounted by a diamond- studded lacy golden caplet with a cross The artistic treatment of the diamond caps expresses the influence of new secular ideas in the Russian art of the late seventeenth century. The economic and political transformation early in the eighteenth century speed artistic development. The traditional medieval outlook was dealt a death blow. For the first Russian Empress. Catherine I a special crown was made of silver gilt. 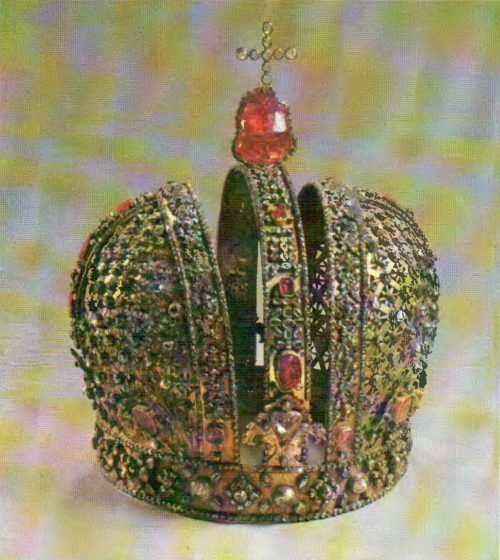 In 1730 a new crown was made for Anna Ioannovna. Its frame consisted of two hemispheres with an arch between them. The crown was executed in silver gilt network and each intersection bore a diamond. The rhombic sections formed by strips of silver held in their turn silver flowers with diamonds in the center. 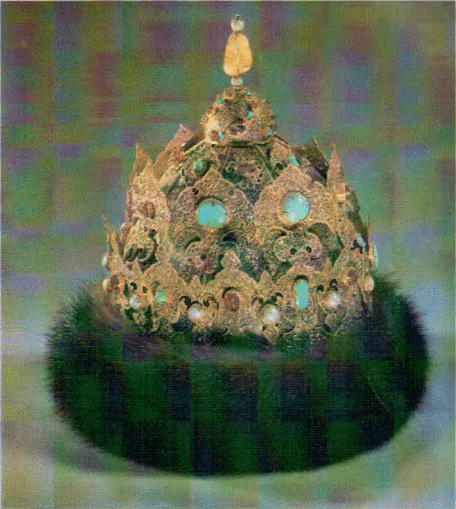 This method made the crown look as if it was composed of diamonds The jewelers used 2,536 diamonds and over 20 other precious stones to decorate the crown A large-size tourmaline surmounts it Uncut, assymetrical, and softly glowing from w thin, the stone preserves the charm of its natural beauty. An important feature in a number of state ceremonies was the throne. 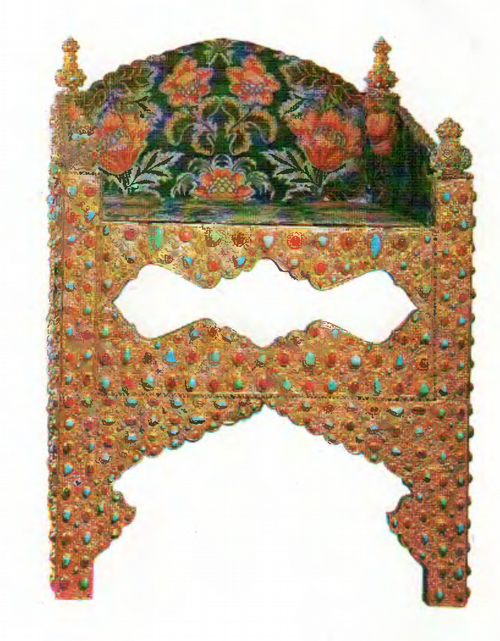 The earliest throne in the collection of the Kremlin museums dates back to copying the earlier Cap only in the general silhouette The golden crown of the Cap, left unadorned sets off the beauty of the precious stones in simple mounts, surrounded with pearls whose design stresses the triangular form of the golden plaques. In 1684 a light-weight cap of silver brocade was made for Ivan Alexeievich. 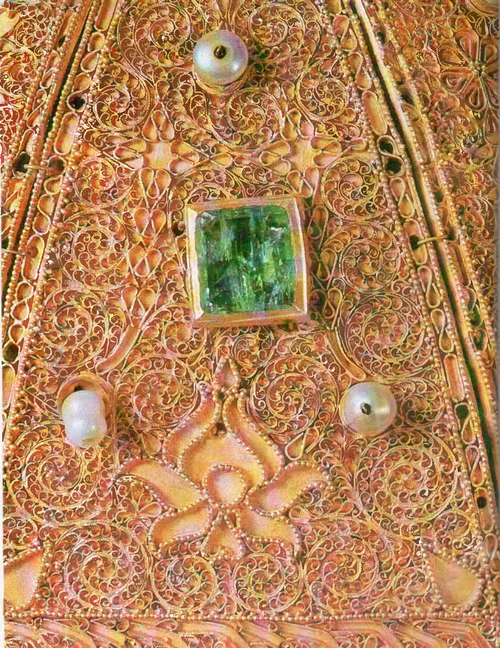 Its crown was decorated with bright-colored ornamental strips and lacy plaques with precious stones and enamel In their form and technique the plaques are close to the decorations on the venets of Mikhail Fyodorovich the sixteenth century. According to legend, it was brought from Byzantium by Sophia Paleologene second wife of Ivan III. 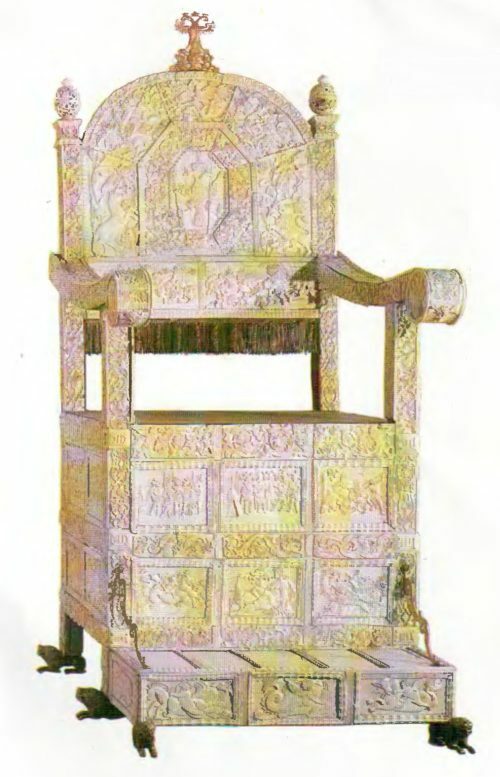 However, documents concerning the throne go back only to the time when this ‘ bone chair’ belonged to Ivan the Terrible The specialists do not agree about the craftsmen who made it Some believe the throne to be the work of German craftsmen, while others сlaim it is Italian. 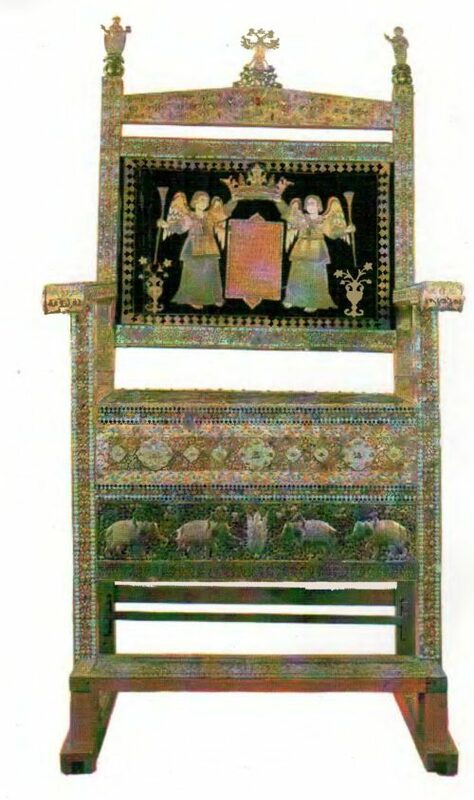 The chair is entirely covered with ivory plaques which bear carved representations of biblical themes and figures of mythical beasts characteristic of the relief carving of the Renaissance. The plaques w th battle scenes were possibly added in 1642, when the throne was being restored. As early as the sixteenth century the Russian state established permanent diplomatic and trade relations with Persia In 1604 Shah Abbas I presented a throne to Boris Godunov, covered with gold sheeting decorated with overall repousse floral design and precious stones. The bright turquoise, the favorite stone of the orient, serves as the basic decorative accent in the design, lend ng a light grace to the throne. Ivan the Terrible also received a throne as a gift from the Persian shah. Early in the seventeenth century this throne was altered for Mikhail Fyodorovich. 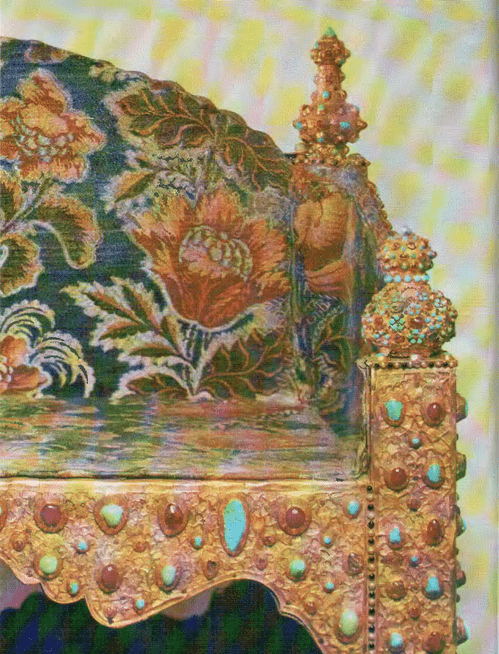 The Kremlin jewelers gave the oriental throne the form of a traditional high-backed armchair. The throne is covered with repousse of delicate design with ornamentation of chrysolites, tourmalines, topazes, pearls and turquoises. The most costly ‘ diamond throne belonged to Tsar Alexei Mikhailovich. It was made by Persian craftsmen on commission from an Armenian trading company it is faced with lacy plaques of gold and silver and decorated with diamonds, rubies and turquoises. Over 800 first-class diamonds went into the decoration of the throne, and that determined its name The raised sides of the seat bear strips of Persian miniatures depicting birds beasts, plants and hunting scenes. On the black velvet of the back two embroidered genu hold a crown of pearls. The shield under the crown has an inscription glorifying Tsar Alexe Mkhailovich. For the two tsars, Ivan Alexeievich and Pyotr Alexeievich, the jewelers at the Kremlin workshops created a double silver throne the only one of its kind in the world. Ivan Zabelin, a foremost authority on Russian antiquity, was of the opinion that the throne was the work of jewelers from Augsburg and Nuremberg, while modern scholars regard it as the work of Hamburg craftsmen Three open-work engraved steps lead up to the seats The light canopy with chased representations of horsemen, birds and fabulous beasts rests on small twisted columns. Three tall, massive pillars with open work designs have two-headed eagles as finials. The pillars served as supports for two scepters and one orb. The small window in the back of the right hand chair was hidden behind a curtain. 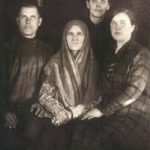 It is presumed that during solemn audiences someone of the mentors of the ten- year-old Tsar Pyotr stood behind the throne or possibly, the regent Sophia, his bete noir. The court ceremonial regalia of the thirteenth to eighteenth centuries in the Armoury collection are in fact monuments of the political history of the Russian state At the same time they are unique works of jewelers art reflecting the talent of the masters who created them.